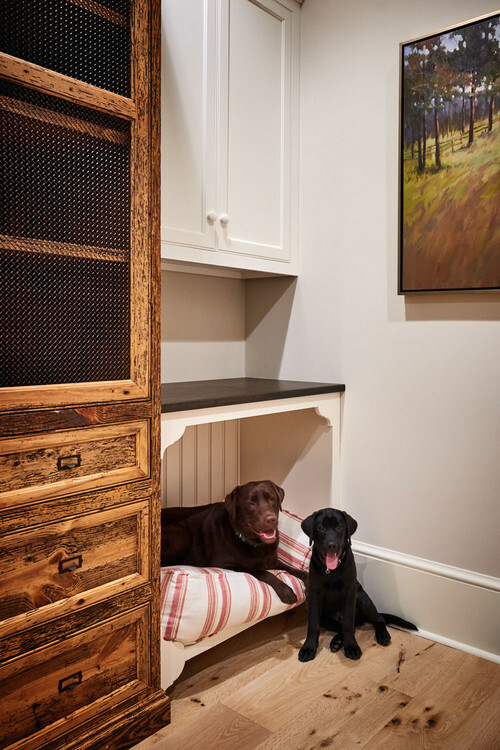 A built-in sleeping area in a home’s cabinetry fits that bill and makes a perfect hideaway for our domesticated canine friends. It can be adapted for any home’s style — traditional, sleekly modern or a bit blingy. An added bonus is that built-ins keep the house uncluttered by clunky dog beds. Here are some striking examples. 2. 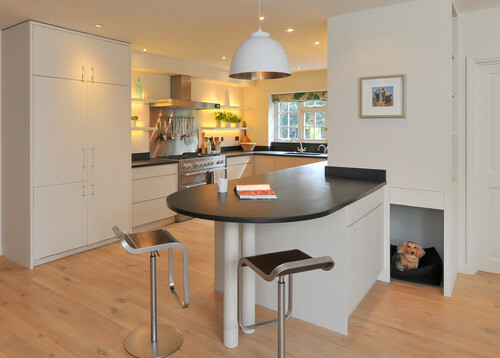 A dachshund gets a cozy nook in this modern kitchen-dining area in a country house near the appropriately named Petworth, in southern England. The cabinetry doors, drawer fronts and side panels are covered in ash veneer. 3. 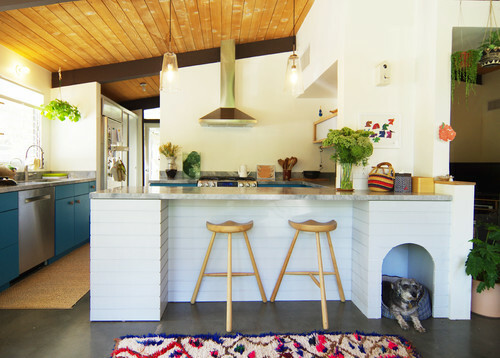 The dog cubby in this kitchen was part of Bunch Design’s partial renovation of a midcentury house in the Woodland Hills neighborhood of Los Angeles. The peninsula is wrapped in strips of painted medium-density fiberboard. 4. 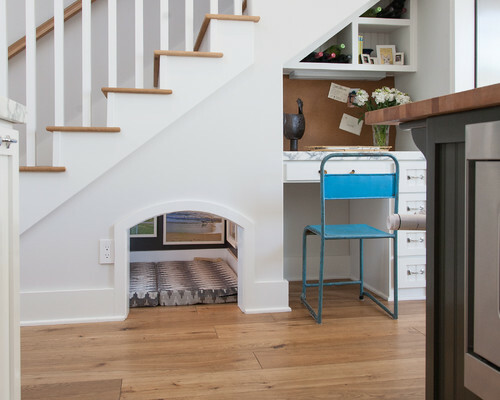 Dog crates, or kennels, can be an excellent housetraining aid, and act as a temporary “special retreat” rather than an all-day cage, according to the American Humane Association. But their boxy, chain-link ugliness is a design challenge. 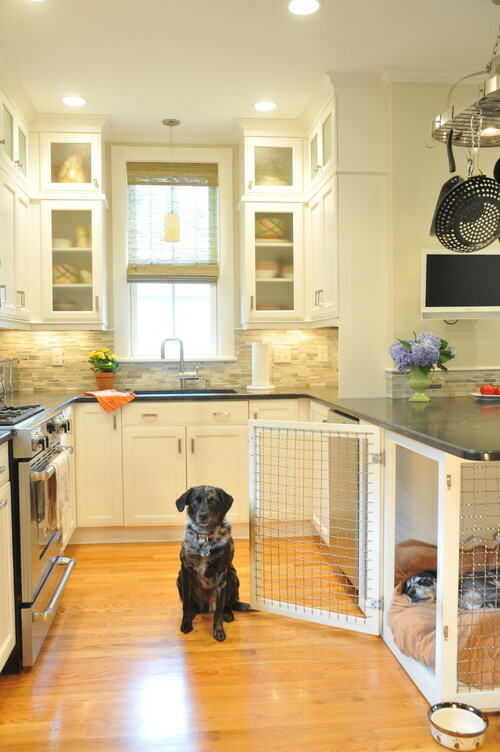 Not for lucky rescue dogs Maxie and Scout, though, who get to hang out in a custom-designed pen in this Newton, Massachusetts, kitchen by Betsy Bassett. The pups open the gate with their noses. The dog den can be replaced with a base cabinet later if desired. 5. This sleeping space under the stairs gets the chic treatment in a Cape Cod-style home in Huntington Beach, California. “Our dogs love it,” says homeowner Janine Roth, who put custom foam beds in the space and painted the walls a dark color, then hung photos of the dogs inside. “Our friends love to stick their heads in and look at all the photos,” she says. The space is bigger than it looks. An electrician fit inside to install can lights, a carpenter added baseboards and a painter finished the walls. 6. 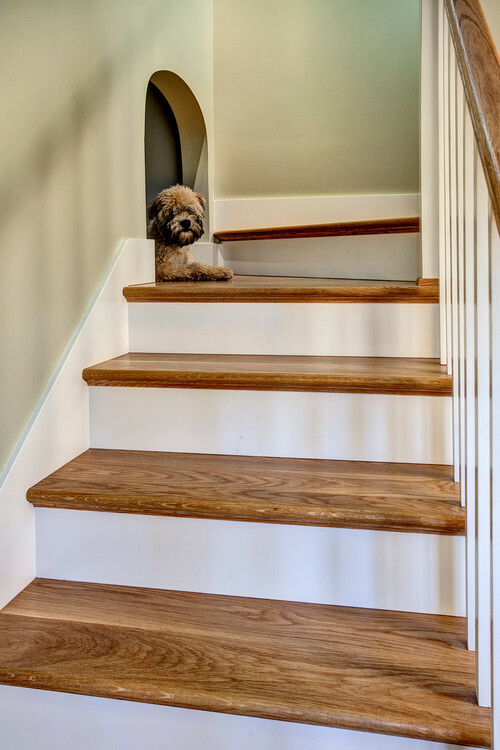 The canine of this house has a view of both upstairs and downstairs from its niche in a stairway landing. The arched opening matches other doorways in the Craftsman homein Seattle. The designers at Board and Vellum carved the recess from an adjacent closet with a dog in mind. The space came first, the dog came later. 7. Designer Mary Ludemann of New Old was tasked with transforming a small space into a laundry room-pocket office-craft and wrapping area, complete with pet station and wall-hung sink, in this English-style fundraising showhouse in Charlotte, North Carolina. She wanted to get the enormous dog bed off the floor and tucked away, so she created custom cabinets to fit a bed insert. (The cover was sewn by a local seamstress.) Her Labs, Briar and Bramble, are shown enjoying the area. The wood cabinets to the left hold 40-pound bags of dog food. 8. 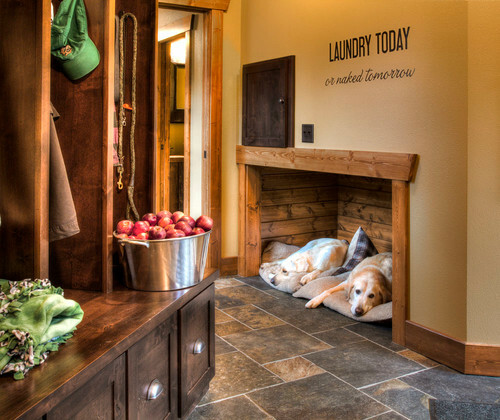 Yellow Labs Blais and Gino snuggle up in bed together in the mudroom of their Minnesota home by Lands End Development. Your turn: Do you have a smart and stylish sleeping area for your dog? Post a photo in the Comments! Julie Sheer is a journalist with more than two decades of experience as a graphics editor and writer at the Los Angeles Times and Chicago Tribune; outdoor guidebook author; lover of all things outdoors, nature and wildlife.